Fiji Airways Men’s 7s Head Coach Gareth Baber says Fiji’s drawing into Pool B for round one of the HSBC World Rugby Sevens Series will motivate the team’s next phase of preparations leading into the Dubai tournament. “The draw provides a mix of styles for us to combat” he said. Fiji were drawn alongside Kenya, Scotland and France for the season opener and Baber is already quite clear on what his team will be up against when they step onto the pitch next month. 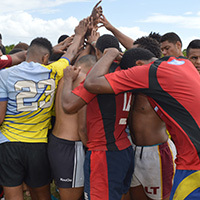 Baber’s squad have been put through an intense 8 week training block including a number of local tournaments in Kadavu and across the island as build up to the Oceania 7’s and HSBC series. Whilst the squad is set to see a range of new faces, the work ethic and intensity shown by the fresh and returning talent has been pleasing to the Welsh Head Coach as he finds a new level for his team going in to 2019. The Fiji Airways Fijiana were drawn in Pool C for the Dubai 7s tournament and will play Canada, France and Spain in their second round of the HSBC Series. A decision on a permanent Head Coach is expected to be announced within the next week as the squad prepares for their upcoming Oceania 7s and Oita 7s tournaments. Meanwhile 2018 Fiji Airways Men’s 7s Captain Jerry Tuwai has been nominated for the World Rugby Men’s 7s Player of the Year, to be announced in Monte Carlo on November 25. The Fijian playmaker Jerry Tuwai earnt a nomination for the second year running after once again carving open defences at will with his vision and step, making the most of his diminutive frame to dart through gaps to create opportunities for himself or those around him. 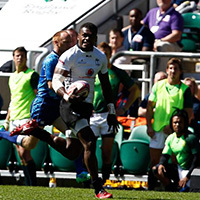 The 29-year-old led Fiji to five titles on the 2018 series, including four in a row from Vancouver to London, and scored 25 tries along the way to also earn a place in the HSBC Dream Team for the series. 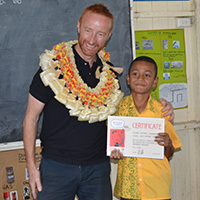 Fiji missed out on the overall series title by two points to South Africa, had to settle for silver in the Commonwealth Games and then finished fourth at RWC Sevens, but Tuwai always plays with a smile on his face and giving Glory to his creator.